Our costs are competitive and simple, with no added fees - no general fees, no technology fees, no hidden fees. Plus, 95% of our students receive financial aid in the form of scholarships and grants. All students are eligible for a scholarship opportunity based upon their cumulative college GPA. 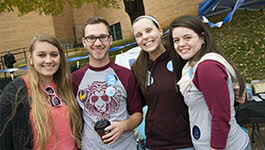 Freed-Hardeman University at Dickson has partnered with Nashville State Community College and Columbia State Community College. You can complete your bachelor's degree in elementary education, business management, accounting, psychology, social work, and nursing (B.S.N.). Most of these programs are offered in a hybrid, 8-week course format, combining an online and in-person educational experience. Ready to Apply at FHU / Dickson? Submit your free online application. Getting admitted is easy, just follow the step-by-step guide and let us know if you need any assistance. After application and admission, sit down with an Advisor to review course offerings and begin constructing your graduation schedule. Tennessee Governor Bill Haslam will be the featured speaker February 28, 2019, at FHU/Dickson’s American Values Forum scholarship dinner. The annual event raises funds for scholarships for students finishing their baccalaureate degrees at FHU/Dickson.